Florence was one of the most important cities in Europe from the Middle Ages to the Renaissance. But Florence’s history starts a long time before that. 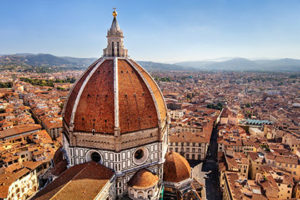 Florence has been inhabited since the 10th century but historians conventionally date its foundation to 59 b.C. as a Roman settlement for retired soldiers with the name Florentia. It was built following the Roman military camp’s style along the cardo and decumanus intersecting at the present Piazza della Repubblica. During the Dark Ages Florence was a minor city in Italy and suffered different barbaric invasions. It was in the 12th century that Florence started growing and became a Comune, a city state. For the following two centuries the city was fought for by the Guelphs (supporters of the Pope) and the Ghibellines (supporters of the Emperor) who each wished to rule the city. Even Dante Alighieri was a victim of these fights: he was exiled to Verona at the beginning of 1300 for being a supporter of the other side at that time in power. It was from the 14th to 16th centuries that Florence became one of the most important cities in Europe when it was ruled by the Medici family. Lorenzo de’ Medici was probably the greatest patron of the city. He transformed Florence into the cradle of the Renaissance by attracting excellent contemporary artists, architects and writers such as Leonardo da Vinci, Michelangelo and Botticelli to whom he commissioned various works. In 1569 Florence became the capital city of the Grand Duchy of Tuscany and Cosimo I de’ Medici was named the Grand Duke of Tuscany by Pope Pius V. The members of the Medici dynasty passed down the title for the next two centuries up until 1737 when Gian Gastone, the last surviving male heir of the Medici clan, died and the Lorraine family took over. The Lorraine family ruled the city and region with great foresight and wisdom until 1860, when Tuscany became part of the Kingdom of Italy. Florence was the temporary capital of Italy for five years from 1865 to 1871. During those years the city was modernized following contemporary standards. The historical center had remained largely unchanged through the centuries and large parts of this medieval city was destroyed including the old market and the Jewish ghetto which were replaced by a new district with larger streets and the big square of Piazza della Repubblica. During the Second World War, Florence experienced a yearlong occupation by the Germans and was heavily damaged by bombs. Curiously, as the German retreated from Florence, all of the bridges were blown up except Ponte Vecchio, many claiming it was considered too beautiful to destroy and spared by orders from Hitler himself. On November 4, 1966 the Arno River flooded most of the city center damaging millions of art treasures and books. The flood left many marks on the city and its artistic patrimony, many pieces of artwork are still under restoration over 40 years later. Florence has a humid subtropical climate, slightly tending to Mediterranean. It has hot summers with moderate or light rainfall and cool, damp winters. As Florence lacks a prevailing wind, summer temperatures are higher than along the coast. Rainfall in summer is convectional, while relief rainfall dominates in the winter, with some snow. The highest officially recorded temperature was 42.6 °C (108.7 °F) on 26 July 1983 and the lowest was −23.2 °C (−9.8 °F) on 12 January 1985. Electricity in Italy is 220 volts, 50 cycles alternating current (AC). Italian sockets are designed to accept round prongs but the Italian plugs can be of two different sizes. Some sockets will take in the plugs with large prongs only, others will take in the ones with small prongs (more common for small appliances; large prongs are used for more demanding appliances such as refrigerators and washing machines). And then there are sockets designed to take in any kind of plug. No vaccinations are required for entering Italy. The official currency is the Euro (€). Please check the currency websites for the current exchange rate. To enter Italy, a passport valid for at least three months beyond the length of stay is required by all nationals, except EU nationals holding a valid national ID card. For information about visa requirements, please visit the website of the Italian Ministry of Foreign Affairs.